PA says death of former chairman is "the crime of the 21st century", vows to find out who is behind his "assassination." The Palestinian Authority said Friday that Israel is the only suspect in the "assassination" of former Yasser Arafat, a day after Swiss experts said tests suggested their veteran leader was killed by polonium poisoning. "We say that Israel is the one and only suspect in the case of Yasser Arafat's assassination, and we will continue to carry out a thorough investigation to find out and confirm all the details and all elements of the case," said Tawfiq Tirawi, head of the Palestinian Authority's inquiry into the death, according to AFP. "This is the crime of the 21st century," Tirawi told a news conference in Ramallah. "The fundamental (goal) is to find out who is behind the liquidation of Yasser Arafat." Arafat died in Paris on November 11, 2004 after falling sick a month earlier. Doctors were unable to specify the cause of death and no post-mortem was carried out at the time. PA society has long given currency to the rumor that Arafat was murdered, with Israel the party most often blamed, but there has never been any proof. Tirawi said PA investigators had studied the findings of Swiss scientists released this week which "moderately" supported the notion of poisoning. In November 2012, Arafat's remains were exhumed and samples taken, partly to investigate whether he had been poisoned with polonium. That suspicion had grown after the assassination in that manner of Russian ex-spy and Kremlin critic Alexander Litvinenko in London in 2006. Speaking to reporters in Lausanne on Thursday, the Swiss team said the test results neither confirmed nor denied polonium was the actual cause of his death, although they provided "moderate" backing for the idea he was poisoned by the rare and highly radioactive element. In 2009 PA leaders, among them Arafat’s replacement, Mahmoud Abbas, began publicly suggesting Israel was to blame for his death. Arafat’s widow, Suha, later provided some of his clothing to a laboratory for analysis, and the clothing was found to contain polonium, a radioactive element that can cause fatal poisoning. Israel on Friday once again firmly denied killing Arafat. "I will state this as simply and clearly as I can: Israel did not kill Arafat. Period. And that's all there is to it," foreign ministry spokesman Yigal Palmor told AFP. "The Palestinians should stop levelling all these groundless accusations at Israel without the slightest proof. Israel did not do it. Enough is enough," he added. On Wednesday, Palmor told the BBC that the entire saga of Arafat’s death was " more soap opera than science." Palmor said the investigations had been commissioned by "interested parties" such as Arafat's widow and the Palestinian Authority and had "never bothered" to look for some key data. 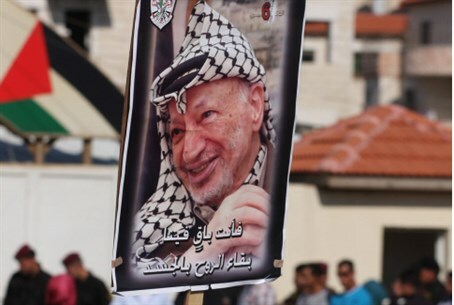 The Swiss experts said the excessive quantities of the deadly substance found on Arafat’s remains pointed to the involvement of a third party. Meanwhile, at Friday's press conference, PA justice minister Ali Mhanna urged France to send findings from an investigation launched more than a year ago. "We've so far received no response from the French side. We've sent a letter to the French demanding they accelerate the sending of results, and we're still waiting," said Mhanna. "From the beginning the French have told us they can't send the results until there's Franco-Palestinian judicial cooperation." Tirawi declared that "France knows the whole truth and details of the martyrdom of Yasser Arafat". A French foreign ministry spokesman told AFP that France's judiciary would decide when the findings were sent, but a judicial official said the results had not yet been received by the courts.